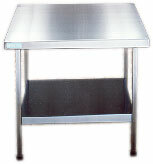 Stainless steel tables available either as kit form or fabricated, standard sizes or ''specials'' to suit. 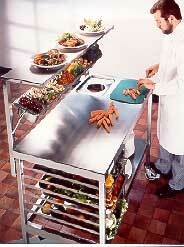 Shelves, drawers, racking, upstands, inset sinks all available. Wooden or polypropylene tops also available. Adjustable feet or castors. Kit form table avaialble as either ''wall tables'' with upstand at rear or as centre flat tables. Lengths 600 - 1800mm, widths 600, 650 and 700mm. All with shelves and mounted on adjustable feet. Drawers available as option. Special sizes can be manufactured. Shelving, cupboards, sinks and hot cupboards as standard unit or made to order.